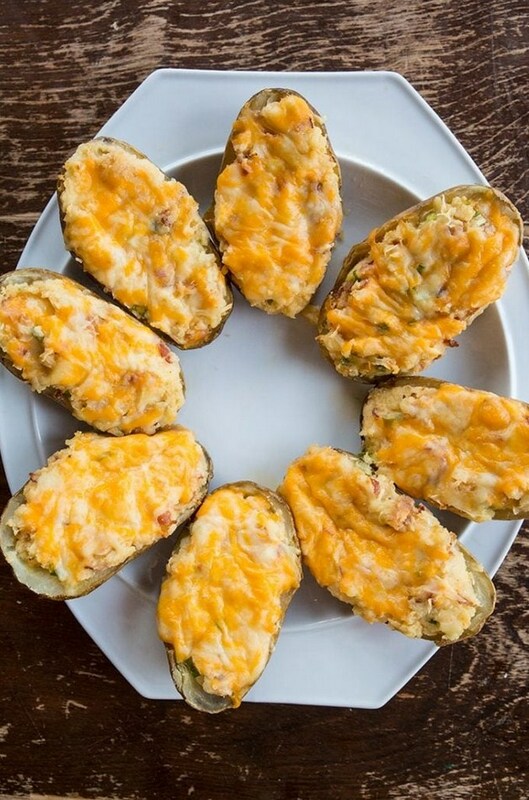 The best ever twice baked potatoes recipe! The seasoning salt is what makes these scrumptious! Pierce each potato with the tines of a fork. Bake your potatoes on a baking sheet, bare with no tin foil, in a 400 degree oven until soft - anywhere from 40-50 minutes depending on the size! Start your bacon cooking, chop it into little slices and cook in a pan. Slice the potatoes in half when they are cool enough to handle. Carve out the soft insides, as much as you want, and put it in the bowl. Leave some in the potato to hold the shape. I find then when you eat it, you can literally just carve off bites one at a time, instead of a mushy mess. Add in your butter, sour cream and cream cheese to the potato filling, mixing in completely. Add milk until they are the perfect texture for your palate. Mix in the seasoning salt and pepper. Drain the cooked bacon and add it and half a cup of cheese to the filling, mixing in completely. Add in green onion to taste, start with a 1/4 cup. Stuff the potatoes with the filling and add the rest of the cheese on top. Serve these with sour cream sprinkled with a little seasoning salt.